Spoon is a multi-author literary journal. A community of writers on the interwebs since 1996 (with a brief 8 year hiatus). We’re here to share stories about our lives, about our travels, about the people we come across. We’re telling tall tales and reading our journals, even telling some fiction. We’re giving away bits of ourselves and seeing through others eyes. We are hungry for writing that takes chances, risks everything, reveals our souls. Work is often short non-fiction, but we would like to see longer works of fiction. We’re just a small place, a truck stop off the information highway. Its cold out there and warm and safe in here. Rest your feet. Rest your eyes from your weary road daze. Wrap your hands around a steaming cuppa and listen for a while and maybe talk a little. When you get there, you’re welcome to sit back and listen or jump in to the conversation with your own story. We’re all neighbors and friends here so we try to treat each other pretty well. 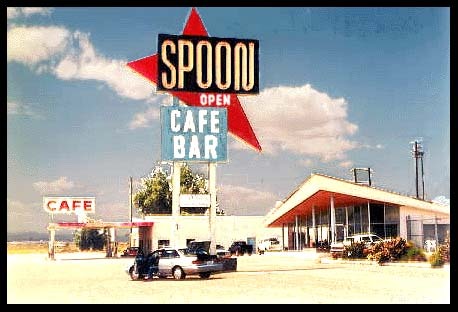 The Spoon is a place for stories, journals, reflections, tales, memoirs, chronicles, narratives, anecdotes, folktales, and fiction. There is discussion in Spoon, but it is first a place for stories. Conversations between only a few people should be taken off-line. There are hundreds of people all over the world listening. Sometimes the wheat can get buried beneath the chaff. The Spoon is a place for original work, not stuff recycled from other parts of the Internet. We can always find that outside the door of the Spoon when we want it. We are kind to each other in the Spoon. Discussions are fine, but please take it off-line the moment it starts looking more like a debate. Just head on out the four-lane and take a right at Moores Creek Road. Then go out 45 toward Bean Blossom. You’ll see us on the left, a few miles outside of town on the way to the lake. The Spoon is the simplest of simple blogs. (It started as an internet mailing list back in 1996.) It is low-tech in this information age of images and pictures. You are always welcome to come in, sit for a spell, and hear stories. If you want to jump in with your stories, send us a note and we’ll make sure you have the ability to contribute to the blog. Email thespoon@thespoon.com. We are professionals and amateurs, performers and everyday folk. We are young and old, show-offs and shut-ins, computer geeks and technophobes. We are storytellers and writers (read “people who write”) and singers of songs. We are friends and lovers and husbands and wives. What we have in common is that we share stories. The Spoon is where we come together to tell our tales. Please spend a moment and introduce yourself to the rest of the folks here. We’re happy to have you. If you feel like it, stay for a bit. When you have to hit the road, you’re always welcome back. We’ll remember your face when you stop on by again. Now what can I get you? Also read about the mysterious superhero origins of the Spoon. A quick word about publishing rights. We’d prefer not to mention it at all, but sometimes it is good to make awkward things clear. Here, the author retains full and exclusive rights to her story and grants Spoon the right to publish it until some day down the road the author might choose to withdraw it. That is, we believe an author should be able to control her own work. That said, we encourage authors to share their work. For instance, the editor prefers to let others copy, distribute, display, and perform his copyrighted work for noncommercial purposes, crediting him by name. In Creative Commons lingo, this would be an “Attribution-Noncommercial-Share Alike” license. If you would like to republish work found in Spoon, please contact the author to ask permission. Post a comment to their story if you do not have contact info.